Sign Language - Look! We're Learning! All of our American Sign Language lessons are gathered here in one place! From learning the basics of ASL grammar to specific vocabulary words for food, feelings, and family, you can begin your signing program right here! This post uses affiliate links. Thanks for your support! Ultimate Guide to Foreign Language for Kids – A huge list of online resources for several foreign languages, including ASL! 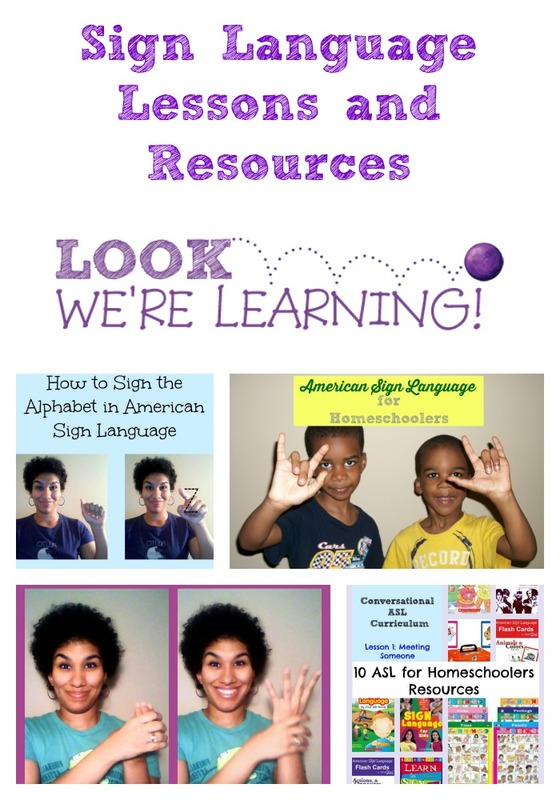 10 American Sign Language for Homeschoolers Resources – Plenty of ASL curriculum options for homeschoolers, especially those who prefer a structured, kid-friendly program. S is for Sign Language – A look at why learning to sign can be so helpful for children, particularly those with special needs such as ADHD. ASL Lesson 1: Alphabet and Number Signs – This video, the first in our series, features a review of the sign language alphabet and how to sign numbers 0 through quadrillion. ASL Lesson 2: Greetings – In this tutorial, we cover how to sign basic greetings such as “Hello”, “How are you?”, and “Goodbye”. ASL Lesson 3: Days of the Week and Telling Time in ASL – The ASL signs for the days of the week are covered in this lesson, as well as how to tell time in sign language. ASL Lesson 4: Family Signs – Our fourth lesson explains how to sign family words such as “Mother”, “Father”, and “Family”. ASL Lesson 5: Food Signs Part 1 – Learn how to order food in ASL with this review of food signs! ASL Lesson 6: Food Signs Part 2 – Even more food signs in ASL, including “soda pop”, “sandwich”, “salad”, and “candy”! ASL Lesson 7: ASL Opposite Words – This lesson demonstrates how to sign 20 opposite words in sign language, including “happy/sad”, “open/closed”, and “tall/short”. ASL Lesson 8: ASL Weather Signs and Seasons – Learn how to sign all four seasons of the year, as well as weather words such as “wind”, “snow”, “rain”, and “hurricane”. ASL Lesson 9: How to Sign Animals in ASL – See how to sign common animals words, including “cat”, “dog”, “snake”, and “fish”! 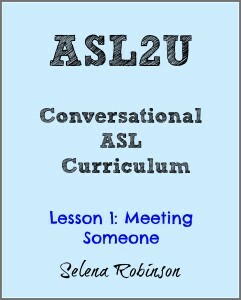 ASL2U Lesson 1: Meeting Someone – The first lesson in our conversation ASL curriculum covers how to introduce yourself in sign language, as well as how to converse about yourself and where you live.